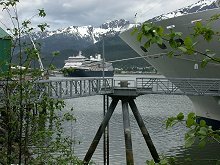 The cruise ships that come to Alaska have always intrigued me. 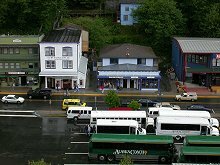 For much of the past 17 years, I've been driver/guide for 8-12 day motorcoach tours around the Yukon and Alaska, and most of my passengers have either just come off a cruise ship, or board one at the end of my tour. 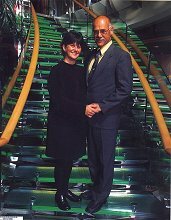 In April 2005 I got an offer I couldn't refuse, and Cathy and I booked onto a 7-day voyage on Royal Caribbean's magnificent Radiance of the Seas. The itinerary was Vancouver - at sea - Juneau - Skagway - Hubbard Glacier - Ketchikan - at sea - Vancouver. Below are a few of the 665 pictures we took (edited down to 562), and notes about the journey and our reactions to it. Click on each photo to greatly enlarge it. I was shooting with an old Nikon Coolpix 4300, Cathy with a days-old Canon Powershot S1. We didn't go on any organized excursions, choosing to just explore each port on our own. The Best of the Cruise: the ship, the staff, the food, the entertainment, the number of activities available - all were top-notch. The Worst of the Cruise: the constant digging for your money - art auctions, shopping infommercials ("Recommended Shopping" is all generic shops rather than local), photographers ($20 a picture - no wonder they burn 95% of them), ad nauseum. 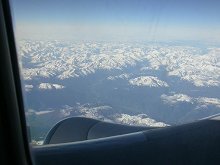 Friday, May 20: below are the Coastal Mountains of northern British Columbia as seen (at 08:43) from the Air North Boeing 737 flight from Whitehorse to Vancouver. We had been unsure of whether to fly in the day before or not; it turned out to be a very good idea, saving a mad rush from airport to ship in the morning. On a flight like this (2 hours, 10 minutes), having a window seat, a camera and a GPS make me a very content passenger! The Quality Hotel, Inn on False Ceek was our choice of hotel for the first night. We got a rate of $106 (Canadian) plus $19.26 taxes from Expedia/Hotels.com. Nothing fancy, but good value. It has an excellent restaurant, the Creekside Cafe (the smoked salmon Eggs Benedict were wonderful! 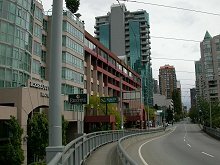 ), and the hotel is an easy walk from English Bay and the water taxis to Granville Island. The rooms are huge, to the point of it being difficult to watch TV from bed, and the noise from Granville Street was quite loud at times. That night we had a very good meal at the Swagat Tandoori Restaurant, 1726 Davie. The buffet was $11.95 each, a better deal than using the coupon in the Vancouver Entertainment book. The 10-block walk was the perfect way to end our first evening. 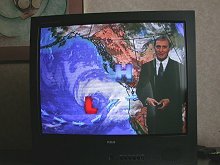 Saturday, May 21: Cathy and I had (of course) been watching the weather forecasts for the BC/Alaska coast for the past week or so, and they had been uniformly mediocre - clouds and showers everywhere for as far as could be seen into the future. Not great, but not bad either, and not unexpected. 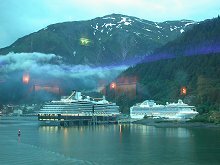 The morning the cruise started, however, Mark Madriga, the BCTV weather guy, showed a huge storm heading for the coast, with heavy rain and 90kmh winds! That should make things interesting. The Port of Vancouver had instituted new security procedures for the Ballantyne Pier area the day before we arrived, and the process of getting into the port area was a mess. 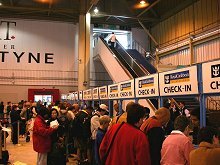 Once we got to the Royal Caribbean counters, though, things moved along surprisingly quickly. The way the huge organizational and logistical challenges were handled impressed us both. Other passengers were not as pleased - those holding passports from other than Canada or the US took up to 2 hours to get through Customs. 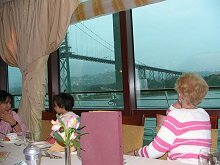 We boarded the ship at 13:05, and on the way down to stateroom 3645, popped in to the Cascade Dining Room. Wow! This scene made the point clearly that we weren't in the Yukon anymore. 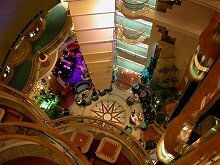 The Radiance of the Seas is truly a magnificent ship. Our stateroom was a huge disappointment - though it was a decent size, it was at the end of the hall next to the crew quarters, and had no window. We called it "The Cave" for the rest of the voyage. The ship was scheduled to depart at 17:00, so we had lots of time to explore the ship, and to watch the activity in the harbour. As it turned out, we didn't leave the dock until almost 19:00 due to some passengers being delayed. The view below is towards downtown Vancouver, with the cruise ship docks at Canada Place in the centre. Just after 19:00, we passed under the famous Lion's Gate Bridge. I had planned on being on deck, but early seating for dinner (18:00) interferred, and the weather wasn't great anyway. Sunday, May 22: winds gusting to 50 knots drove seas to 6 meters (20 feet) off Vancouver Island (this shot was taken at 06:50). Though the decks wobbled a bit, the Radiance handled the storm beautifully. The Captain later said that he's been on the ship in 50-foot seas. This view is from Deck 5, some 50 feet up - the waves were far more impressive from Deck 3. Dressing up isn't part of our Yukon lifestyle at all, but the first formal night was fun for both Cathy and I. The last time I'd had that suit on was 1995 when I spoke at a conference in eastern Canada. There were two formal nights, one on each sea day. People who didn't want to dress up just went to the casual Windjammer to eat. 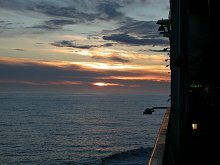 Sunset at 20:59, west of Prince of Wales Island, Alaska - not quite the Midnight Sun yet, but getting close! 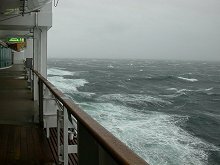 The storm had abated in the early afternoon as we approached Southeast Alaska. 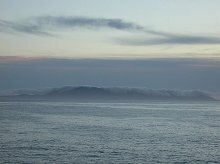 Forrester Island, west of Prince of Wales Island, with a crown of clouds, captured 2 minutes after the sunset photo above. The Centrum is the focal point of the ship. 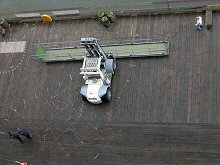 The floor is on Deck 4, the roof is the top of Deck 12. From music and dancing to art auctions, there was always something going on there - glass elevators running up the sides enhanced the drama of the architecture. Off the Centrum on various floors are some small areas where you can get away by yourself, such as the Library (poorly stocked) and the Yacht Club. 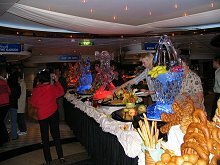 The first Midnight Buffet - we had been warned about these! We just went in for a look at the ice sculptures, vegetable carvings and other artistic displays, but my willpower faded and I enjoyed the food as well. 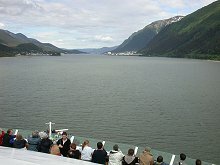 Sunday, May 22: approaching Juneau at 10:30. We woke up at 05:50 but saw solid fog on the monitor (Channel 32 on the TV); the fog bank could be seen behind us when we went up on deck 20 minutes later. It was a fine morning - at 7:15 we saw humpback whales off to starboard. The small cruise ship Spirit of 98, southbound, changed course and stopped to watch them - one of the advantages of small-ship cruising in these waters. On the dock at Juneau is a large "map/mural" of the world, made with steel and copper nails pounded into the dock (you can see it on the enlarged photo, in the wood around the forklift). The dock activity upon arrival or prior to departure was always interesting to watch. Progress in an Alaska port. 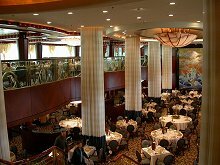 It's not that many years ago that I stayed at a wonderful historic hotel overlooking the Juneau harbour, and had a truly memorable meal at the restaurant downstairs. It is now the tanzanite store seen to the left of this picture. We had planned on going up the Mount Roberts tram for some hiking and then taking a cab out to the Last Chance Mining Museum, but the rain (sporadic but occasionally heavy) ended those ideas. Alaska Heritage Coffee Company on Franklin Street has great coffee and the best people-watching chairs in Juneau, and we browsed some of the shops, notably the artists' cooperative, also on Franklin. High-pressure sales people in a couple of the stores cut our shop browsing short, though, and we were back on the ship well before departure time. To the left, the Zaandam is seen behind the bow of the Radiance. Though she was launched in 2000, only a year before the Radiance, the much smaller size, dark hull and "classic" styling of the Zaandam prompted descriptions such as "ferry" and "warship" from our fellow passengers. The huge number of "bush planes" operating in Alaska is one of the things that make the state unique, and I can sit and watch them all day given the opportunity. 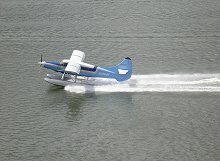 This beautiful bird, seen taking off from Juneau harbour, was originally a DeHavilland DHC3 Otter when it was built in 1958, but is now a Turbo Otter, or Super Otter, after being modified by Texas Turbine Conversions. It is operated by Wings of Alaska. Departing Juneau en route to Skagway, at 21:35. The Zaandam and Diamond Princess, seen through the dining room window, passed us some time during the night, and were both docked at Skagway when we arrived the next morning.